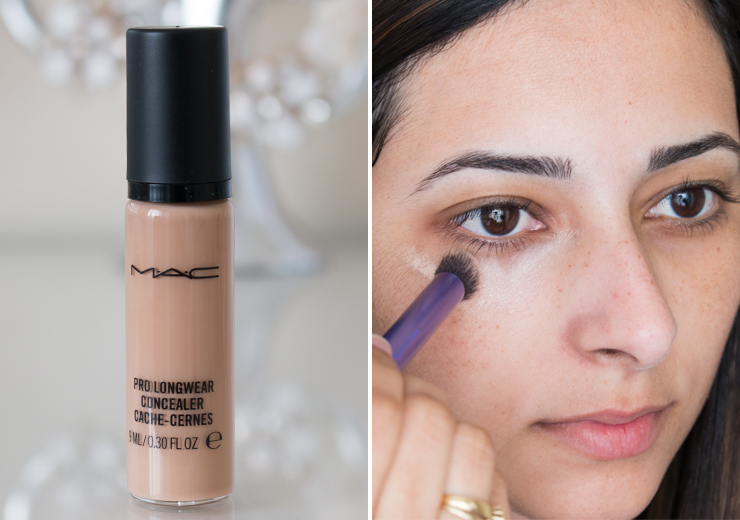 If there’s one thing I’ve owed you for a long time is this Mac Pro Longwear Concealer review. I’ve spoken about this concealer a million times and when I checked my Archives, there wasn’t a dedicated review for it – that’s just wrong! So when my brand new shiny new bottle of ‘perfect skin magic’ arrived a few days ago, I decided the time had come for a proper full on Ysis-style review. I’m shade NW20, for reference. This is the Mac Pro Longwear Concealer, a medium to high coverage and extremely long-wearing concealer with a natural matte finish. It’s oil, talc and paraben-free, and it’s available in 16 shades, being 8 warm-toned and 8 cool-toned. Cyclopentasiloxane, Water, Trimethylsiloxysilicate, Butylene Glycol, Sorbitan Sesquioleate, PEG/PPG-18/18 Dimethicone, Tribehenin, Magnesium Sulfate, Phenyl Trimethicone, Tocopheryl Acetate, Sodium Hyaluronate, Glycerin, Dimethicone, Methicone, Ethylhexylglycerin, Pentaerythrityl Tetra-Di-T-Butyl Hydroxyhydrocinnamate, Laureth-7, Xanthan Gum, Phenoxyethanol, Chlorphenesin, Sorbic Acid [may contain] (CI 77891/Titanium Dioxide, CI 77491/CI 77492/CI 77499/Iron Oxides). This concealer has a creamy liquid texture and a matte finish. Normally, concealers come in either a moist and creamy texture for the under-eye area or a dry and firm texture for blemishes and other areas of the face. The Mac Pro Longwear Concealer is, in my opinion, the best of both worlds – it’s moisturising enough for under the eyes and firm enough for blemishes. Despite being a liquid concealer, its thick & creamy texture dries and sets pretty quickly with a matte finish. After that, it won’t budge! I have literally put this concealer through hell and back, and it has never creased on me. 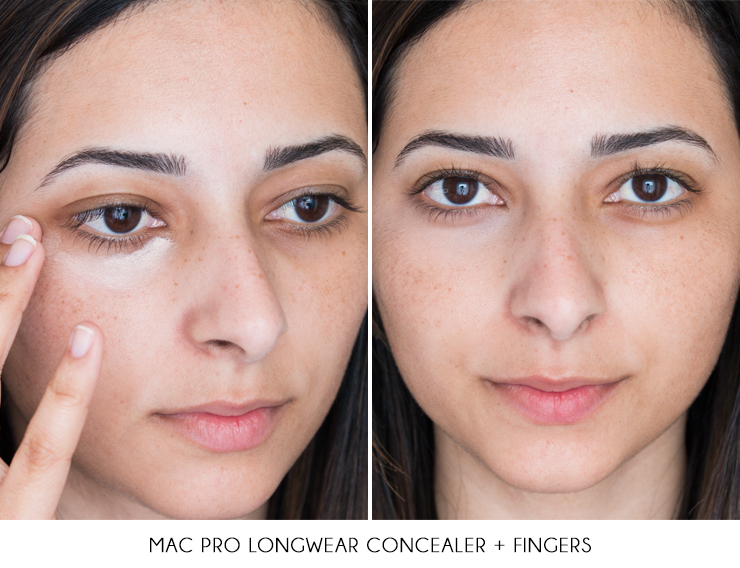 The Mac Pro Longwear Concealer has a great medium to high coverage; it covers dark circles, blemishes, scars, veins, redness and pretty much anything else that you throw at it. You need the smallest amount of product, as it’s very pigmented and a little goes a long way. 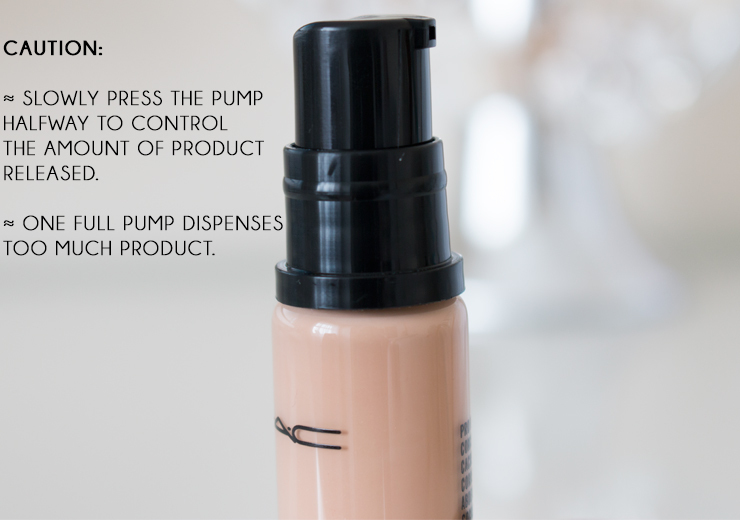 Be gentle with the pump, or it will give you enough product to conceal your whole face! It is also relatively lightweight for such a full coverage and long-wearing concealer; as long as you moisturise your skin beforehand, it doesn’t cling to dry patches and it looks very good on fine lines. I only need one layer under my eyes and on any blemishes and redness to get a perfect full coverage look, but if I’m extra tired or with lots of blemishes, I can go up to 3 layers without it creasing on me. Pretty impressive! This concealer works well with fingers, brushes and sponges. If I want a more natural coverage, I use my fingers; for a flawless look, I apply it with the Real Techniques Deluxe Crease Brush, and if I want a perfected seamless natural look I opt for applying the Mac Pro Longwear Concealer with the Beauty Blender. Mac Pro Longwear is thicker than most liquid concealers, which is what gives you that great full coverage, but it’s not too thick that it cakes up on the skin. This is the only concealer I’ve tried that gives me enough coverage and doesn’t crease under my eyes. It doesn’t contain oils, talc or parabens in its formula, and as far as I know, it’s SPF-free as well. 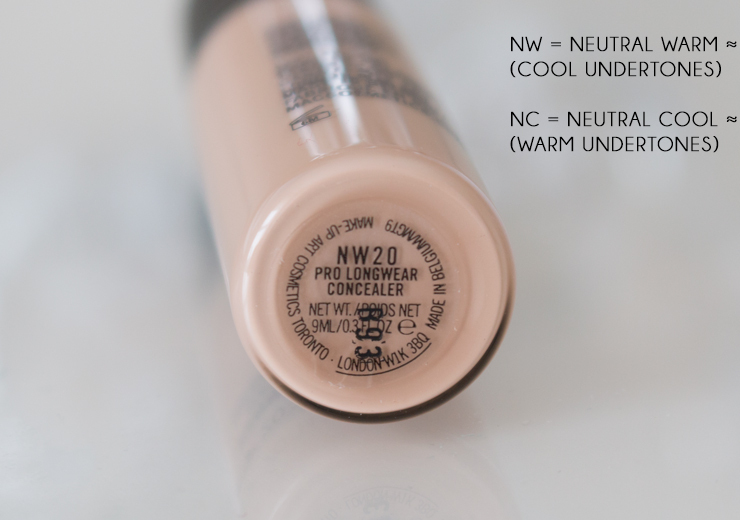 This concealer comes in 16 shades – 8 warm-toned (NC) and 8 cool-toned (NW). Logically, you would think that NC shades would be cool and NW shades would be warm, but MAC works with the colour wheel of complementary colours, so the NC (neutral cool) shades are meant for warmer skin tones and the NW (neutral warm) shades are meant for cooler skin tones. 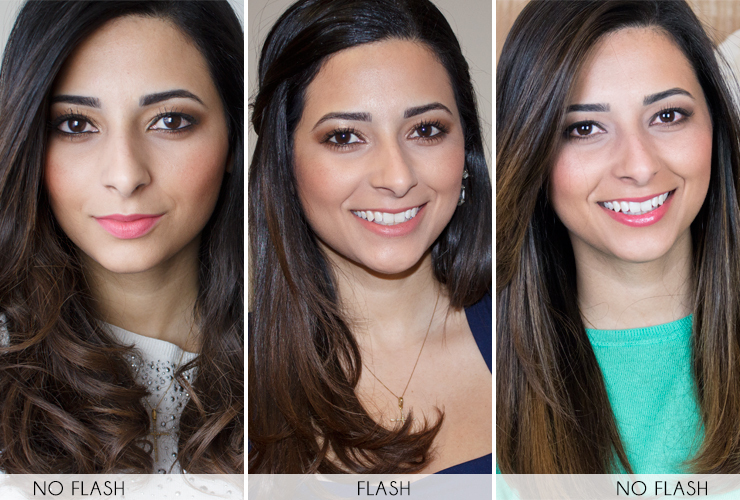 This way, the shade of your concealer or foundation will neutralise the tone of your skin. Unfortunately, the Mac Pro Longwear concealer does not cater for plain neutral undertones, so if you’re neutral like me, you’ll have to find the closest shade to your skin tone or mix two undertones together. 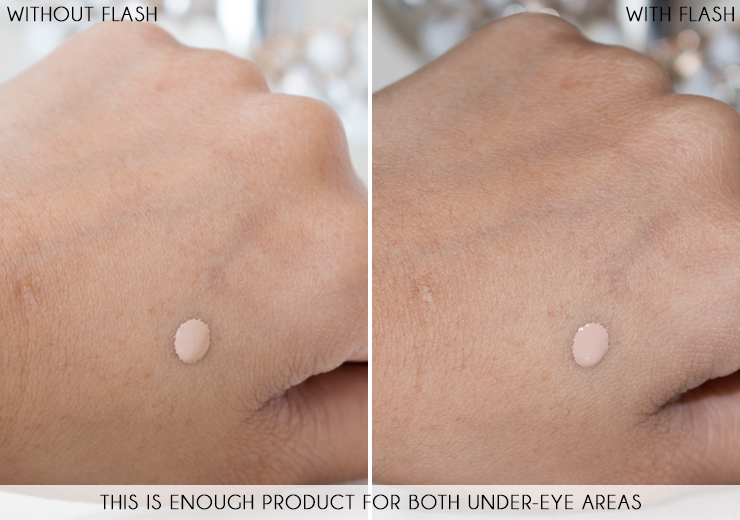 My shade is NW20, which is perfect to brighten my purple/brown dark circles and ok for my blemishes and redness. Ideally, the shade NC25 (warm) is a slightly better match for concealing around my face, but if I blend NW20 really well with my foundation, I can get away with it. Mac claims that the Pro Longwear concealer lasts up to 15 hours, which I can totally vouch for. 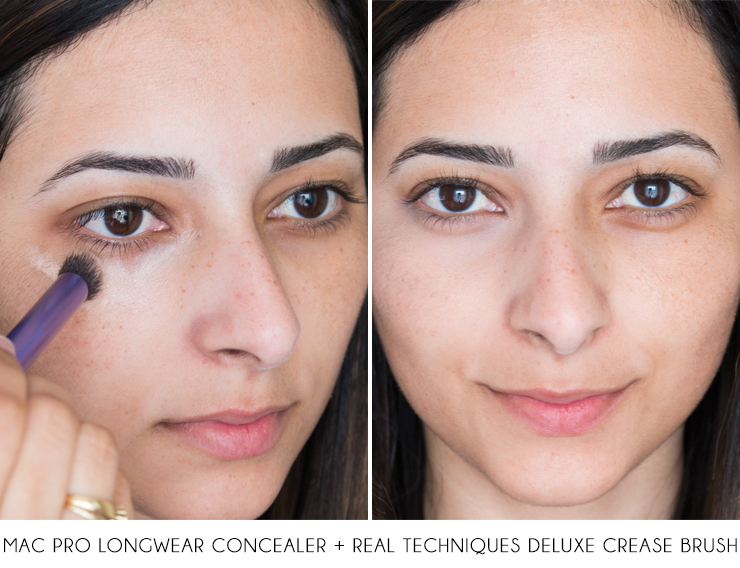 The biggest test to this concealer on me was my wedding day, and it performed superbly well. I applied my makeup at 7.30am, lightly touched up my concealer at 4pm and when called it a night at 2am my face still looked flawless! This concealer doesn’t crease at all on me and once it dries and it stays put for a really long time. As fas as I’m aware, the Mac Pro Longwear Concealer doesn’t contain SPF, which means it’s the perfect concealer for Red Carpet events, special occasions, weddings and photo shoots. But please correct me if I’m wrong, as I couldn’t find any concrete information online about SPF in its formulation. If you’re using this concealer on a day-to-day basis, remember to apply an SPF all over your face before your foundation. 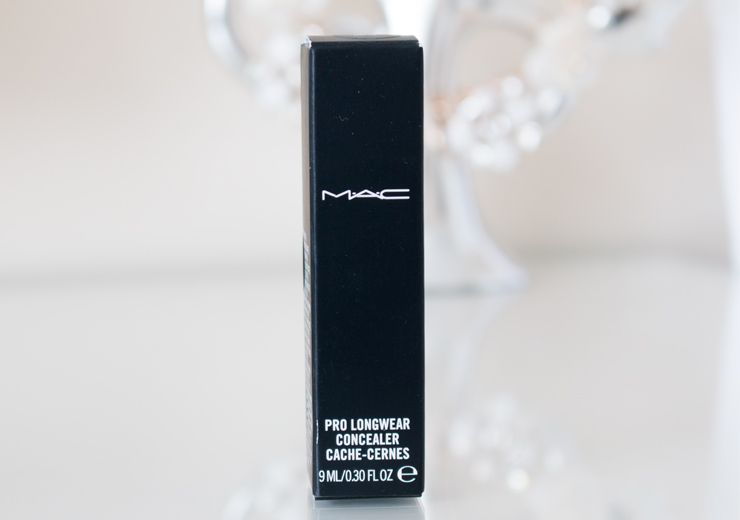 I couldn’t recommend the Mac Pro Longwear Concealer enough! It’s longwearing, lightweight, medium to full coverage, it’s great for blemishes, redness and dark circles, it doesn’t crease and the little tube lasts absolutely ages. The only downsides for me are the pump that dispenses too much product and the lack of true neutral shades. Even so, I don’t think I could live without this concealer and I will forever repurchase it! I’ve worn this concealer on so many of my photos and videos, so below are links to some videos where you can the Mac Pro Longwear Concealer it in action. The Mac Pro Longwear Concealer is priced at £15.50 ($19) for 9ml and it’s available from most Mac counters and department stores. Here’s a list of some sites where you can buy this concealer online in the UK and US. 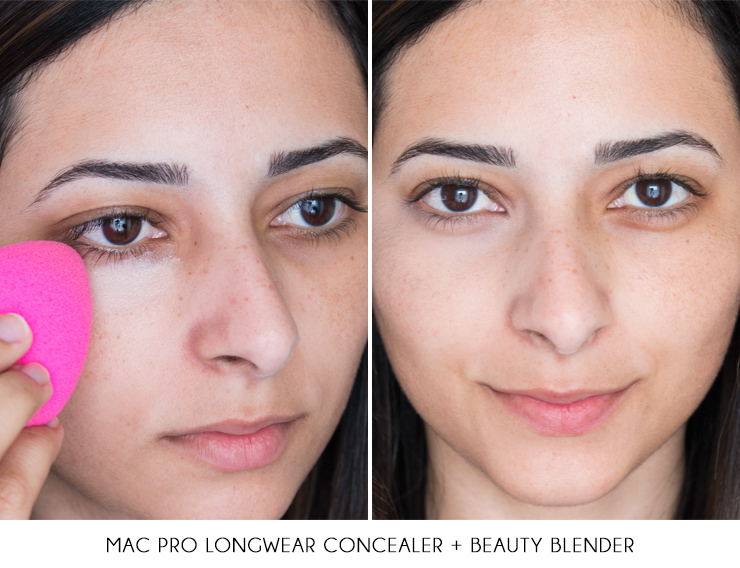 Have you tried the Mac Pro Longwear Concealer? What’s your favourite concealer? looks awesome! will definitely give it a go! by the way, i really like how clean and organized your blog is! Seriously you are so beautiful! And the whole time I was reading I swear I had one of my eyes glued to your eyebrow because it is so perfect! This is a great review. I’ll definitely have to give it a go. Thanks for sharing! 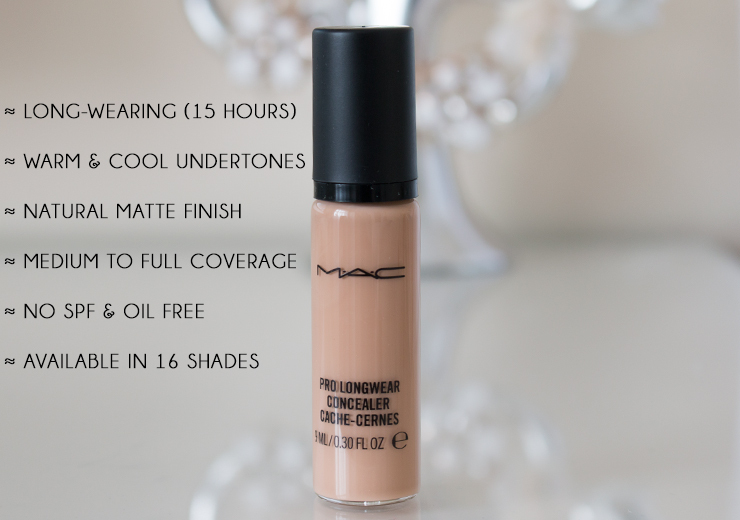 I cant get enough of the Mac Pro Longwear concealer, I wont buy another ever I dont think! Great review. Wow what a great, thorough post, i”ll definitely be picking one of these up, sounds like great value too. Such an amazing review and you’re pictures are picture-perfect! I might need to a trip to my local Mac store now! Any idea how this compares to the Nars radiant creamy concealer? I totally forgot about this concealer, I have it somewhere…. I have to agree that the pump just dispenses too much product. I have to try it again though. I remember the coverage was really good. Perhaps mine is the wrong colour and that’s why I don’t use it… (NC15). Great thorough review! :) I was wondering if you found that your concealer oxidizes at all? I was matched to NW30, but after an hour of wearing it, it becomes so dark, so I had to switch to NW25. Thank you! Hi ysis i’ve been eyeing this concealer ever since i first saw u using in ur tutorials.i luv ur blog btw I stalk it every time I get to.one question though I read somewhere dat if i m NC 42,I shudn’t pair it wid same complexion foundation.concealer.I shud b using NC 42 foundation wid NW range concealer to even everything out.what do u think about it? Hey Samra! I think you’re right – when I first bought MAC foundation (Studio Fix Fluid NC44), and was after concealer, the MAC rep paired it with an NW35 concealer. I think the reasoning is that as my skin is darker, blemishes, dark circles, etc. would need an NW to counteract the cooler undertones in blemishes? Wow, I just stumbled on your blog and you’re reviews are so in depth. I’m currently using MAC’s Select Cover Up but you’re definitely making me want to go out and buy this one! 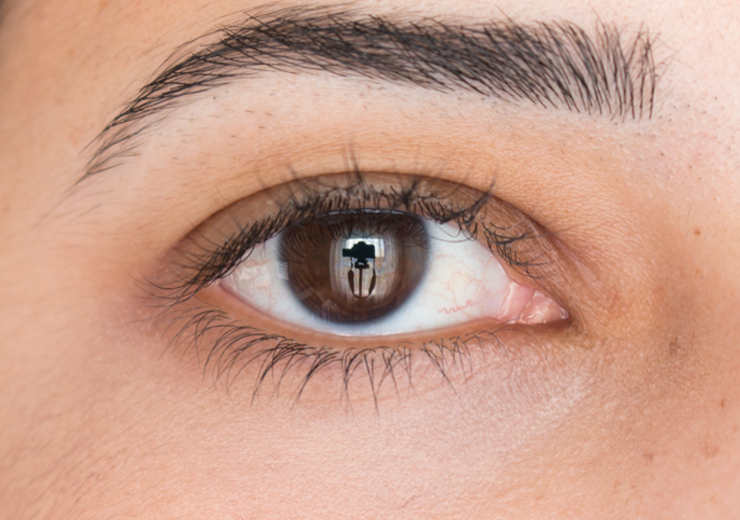 under eye concealer is one of the best eye concealer in the world.Thanks for this information. I love this product!! Can’t live without it ! OMG Your brows are looking so beautiful! omg!!! you are so beautiful..